Brindi's Supporters Speak: The TLC Shelter: "One huge cruel joke"
In response to the most recent press release by the NSSPCA re “Brindi” the dog on June 1, 2009, we the tax paying and donation supporting public are outraged at the latest bit of propaganda put out by this public funded animal welfare agency. We refer specifically to the alleged “high” level of care purported to be given this dog. Please note that by the society’s own admission, this dog has been kept incarcerated for almost one year now in a facility not meant to house dogs for extended periods of time. By their own admission, Brindi is never walked on leash off site, but instead is put in a small concrete pen outside the shelter for a purportedly two hour period each day. During the winter this pen was constantly iced over making it an extremely dangerous place for a dog to exercise. The press release further states that in addition, Brindi is given free time outside her cage where she is allowed to accompany the shelter staff presumably while they go about their regular chores of cleaning kennels, etc. Further, they advise her health has been monitored regularly by a vet who also presumably comes weekly to check on all the dogs at the shelter, not just Brindi. Other reports have this vet visit at once every two weeks. Nowhere was there mention that Brindi recently had surgery to remove three cysts discovered while there, cysts that weren’t there when she arrived! Our group warned months ago that living in such conditions would create undue stress on this dog that could contribute negatively to her health. Her lack of proper exercise has also contributed to an unhealthy weight gain which may present future risks to her well being. Her training has taken a backslide as she has been encouraged to jump up on people, a behaviour her owner was very careful not to encourage and again, a behaviour she did not come into the shelter’s care with. So far from receiving a “high” level of care, we would argue that this poor animal has suffered by virtue of her incarceration in a facility not designed to accommodate animals for long periods of time and where the neglect is obvious. We are led to believe also that when this shelter is closed on Mondays, she receives little or no care! If this is considered high level care, then we pity those other animals whose care must be minimal at best. In contrast, the Tender Loving Care Shelter, a no kill facility in Digby, Nova Scotia, that receives NO government funding, is open seven days a week staffed by a small dedicated team of volunteers who receive NO compensation for their efforts and provide all animals a superior level of care such as cageless environments for the cats and several daily on leash walks for all their dogs who spend the majority of their time outside in fresh air and in runs designed especially to meet their needs. We welcome visits from the press and public at any time. 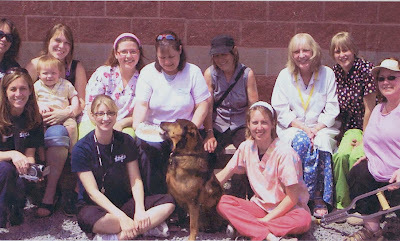 The most shocking thing to discover, however, a picture circulating showing Brindi front and centre surrounded by a smiling and caring SPCA staff and what appear to be family members, friends or other volunteers - feeding her birthday cake! Two people in the photograph are kneeling on either side of Brindi at face level and one person is holding a baby. Now what is wrong with this photograph? For starters…where is Brindi’s muzzle???? Was she not ordered muzzled whenever she was around members of the public? Surely, a dangerous dog like Brindi, whom the Mayor could not see releasing for fear that she might “bite” somebody (which for the record she has never done) should not be permitted to be seated among so many unsuspecting people for at any moment this aggressive, dangerous dog might launch into a full out attack on those around her! If there was not more solid evidence for Brindi’s immediate release to her rightful owner, then we don’t know what is! This whole fiasco has been one huge cruel joke played out at the expense of this poor dog and her terribly maligned owner Francesca Rogier who has fought tirelessly for almost a year now at great financial and emotional expense to have her dog returned. This dog was NEVER deemed dangerous and should have NEVER been held in this prison for so long. This has and always was a power trip - ego driven and politically motivated to justify a wrongful decision made by an agent to have Brindi euthanized and which was subsequently overturned in a court of law. This smacks of a vendetta pure and simple by the NSSPCA and the HRM against Francesca Rogier for calling out the conflict of interest that exists between those two entities. According to the NSSPCA, their contract with the HRM negates them from making any decisions regarding what is in the best interest of animals in their care if they fall under HRM jurisdiction. In other words, in the case of Brindi the dog, they have willingly participated in what amounts to cruel and unusual punishment towards this animal, in direct violation of their mandate as a “society for the prevention of cruelty to animals”! Not only to Brindi, but also to her owner by denying her regular and consistent visitation to her animal to provide her with the love and attention Brindi so desperately needs, deserves and is entitled to! We demand this intolerable situation be brought to an end immediately with the safe return of Brindi to her rightful and lawful owner Francesca Rogier. This dog, as evidenced by the most recent photo included with the press release from the NSSPCA, is not a threat to anyone and deserves to be with her owner until the charges against her are dealt with in a court of law. In our opinion, this is one of the sickest and cruelest cases against animal and owner that we have ever seen perpetrated by a body that was designed to do just the opposite. Shame on the NSSPCA for putting their own interests ahead of the animals. Far from changing their image as they promised to do over one year ago, they are sinking ever further into the murky abyss and donors should carefully think before directing any funds their way until they clean up their act once and for all and most especially release this dog to her owner! SPCA Addresses Inquiries About "Brindi"
In response to hundreds of inquiries from both the Society's membership as well as the public, the Nova Scotia SPCA (NS SPCA) would like to clarify the level of care being provided to Brindi the dog at our Metro Shelter in Dartmouth. Brindi was placed into the care of the Metro SPCA shelter by the Halifax Regional Municipality (HRM) in July 2008. There have been many and varied inquiries and concerns about the SPCA's involvement in this case, which the NS SPCA wishes to clarify in more detail to our members and the public. The NS SPCA is contracted by HRM to provide kennel space and care of any animals brought to the facility by HRM Animal Services. To clarify, the NS SPCA does not have the authority to make any decisions related to the outcome of Brindi's case. While HRM is not required to consider the input and advice of the NS SPCA, SPCA representatives have been in frequent contact with HRM about Brindi and have proposed alternative options for Brindi's care and the resolution of the case on multiple occasions. With respect to the care being provided to Brindi by the Metro SPCA shelter, the NS SPCA wishes to reiterate that Brindi is receiving a very high level of care during her stay at the shelter. She receives regular weekly check-ups with the shelter veterinarian, she receives bathing and grooming by volunteer professional groomers, she is out of her kennel seven to eight hours a day accompanied by staff, she spends close to two hours outside daily, and on Mondays when the shelter is closed to the public she spends the entire day out of her kennel. Shelter management wishes to provide the best possible care for all shelter animals; to that end, since the shelter is not designed to be a long-term care facility, shelter management has been providing this modified care regime for Brindi. The shelter veterinarian has consulted with one of only five board certified animal behaviorists in Canada, who is located at the University of Prince Edward Island's Atlantic Veterinary College, to discuss Brindi's daily care routine and seek a professional opinion about the level of enrichment we are providing. The behaviorist's comment was that Brindi is getting more human interaction and enrichment than many dogs in a regular home environment. The NS SPCA is providing a high level of care and enrichment for Brindi and hopes to see this case resolved as soon as possible. Media requests and interviews will be most quickly addressed by directing them to media@spcans.ca.